The Pride Go-Go ES2 3-wheel travel scooter provides durability and increased portability with an industry-proven drive system and design. Perfect for someone looking to find exceptional value at an entry-level price, the ES2 is simple for first time users. The straight tiller design with the foldable, molded seating system puts you in position to easily maneuver your scooter both indoors and outdoors. There are only two speed settings on the ES2, high and low, which provides clarity to novice users. Features such as the non-marring tires and the removable fabric front basket are often overlooked but add quality to this mobility vehicle. 250 lbs. passenger weight capacity. Available in Black. Max speed: 4 mph. Seat size 17"W x 15"D. Range: Up-to 6 miles. 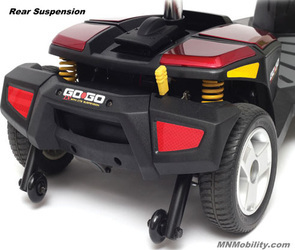 The Go-Go Ultra X scooter is a lightweight ride suitable for travel on well-groomed paths and paved surfaces. Easy to break down into lightweight sections, this model is a breeze to transport and store. Heaviest piece weighs just 29.5 lbs. for the 3-wheel model, and 34 lbs. for the 4-wheel model. 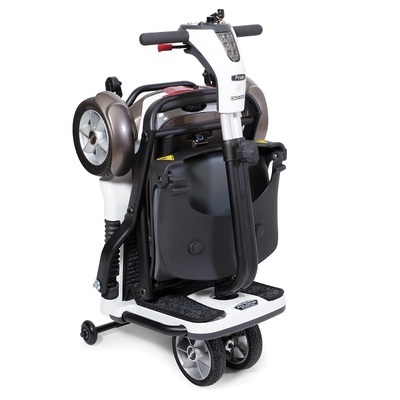 Equipped with convenient feature such as a basket and flat-free tires, the Go-Go Ultra X makes it easy to transport personal items without the worries of a flat tire. Reliable and functional, the Ultra X boasts a stable design, it turns on a dime and it's an affordable mode of travel suited to indoors and out. 260 lbs passenger weight capacity. Available in Red or Blue. Max speed: 4.25 mph. Seat size 17"W x 17"D. Range: Up-to 8 miles. 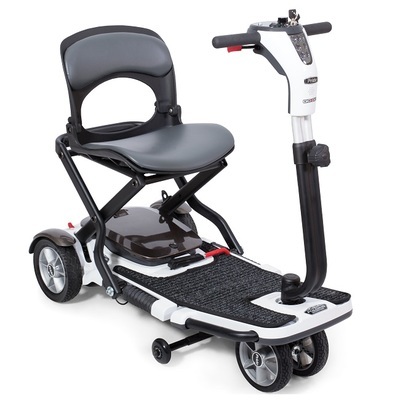 Lightweight and easy to disassemble, the scooter also features interchangeable color body panels or Red, Blue, or Silver. Disassembly is easily accomplished with one hand with the heaviest piece weighing just 29.5 lbs. for the wheel model and 34 lbs. for the 4-wheel model. The Go-Go Elite Traveller is a compact and maneuverable scooter that our customers find convenient and easy to operate. The upgradable 18-amp hour battery ($100.00) makes this scooter a versatile choice for individuals who require mobility assistance for errands and in-home use but would like the option of extended travel range for longer trips such as a full day of shopping. 300 lbs passenger weight capacity. Max speed: 4 mph. Seat size 17"W x 17"D. Range: Up-to 7 miles with standard 12ah batteries or 14 miles with optional 18ah batteries. 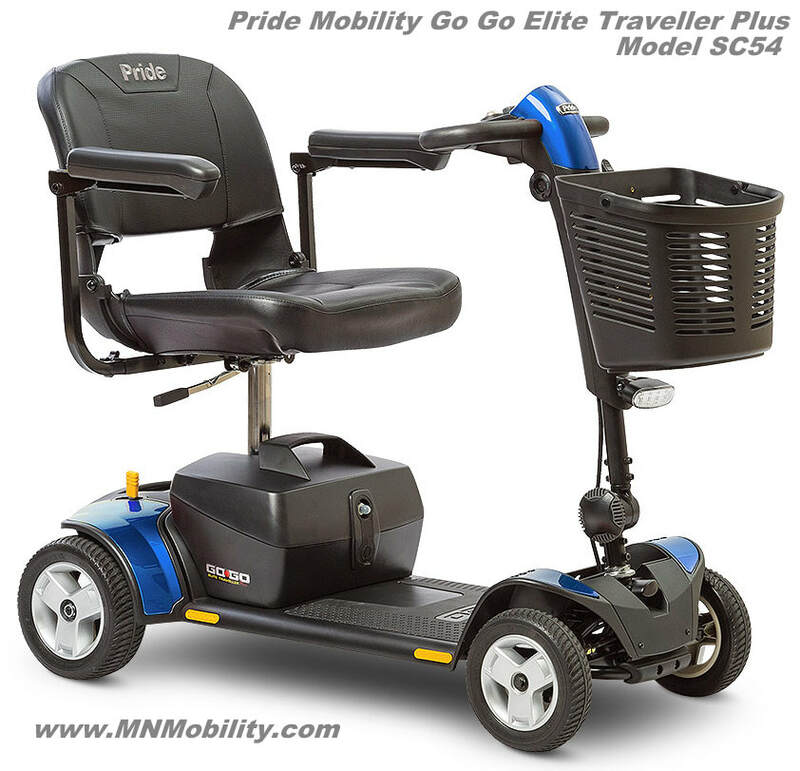 The Go-Go Elite Traveller Plus from Pride Mobility ships with a standard 18AH battery to keep you on the move. The big "PLUS" is that this model has a frame that is stretched and widened to provide a larger foot platform and better ground clearance than the regular Elite Traveller. 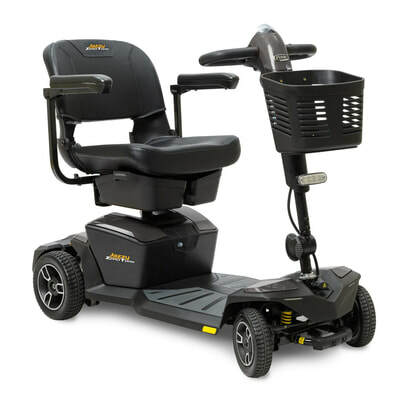 The wraparound delta tiller provides controlled steering for those with limited dexterity and convenient features such as flat-free tires, a front basket and interchangeable color panels of Red, Silver & Blue are all standard. The feather-touch disassembly makes the Go-Go Elite Traveller Plus the easiest travel scooter to take along anywhere. 300 lbs. passenger weight capacity. Max speed: 4.5 mph. 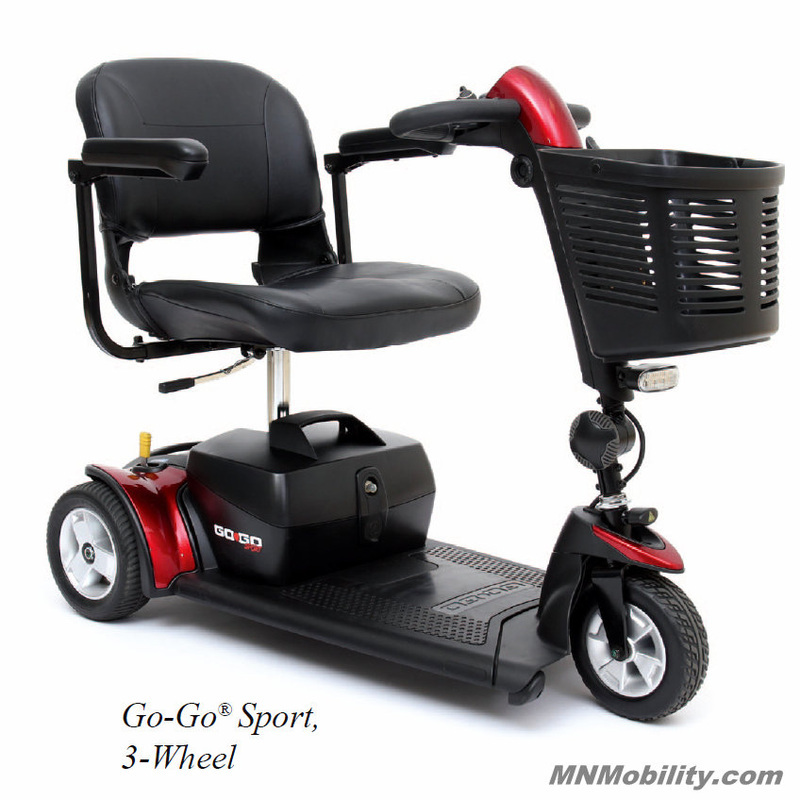 Seat Size: 17"W x 17"D. Range: Up-to 12 miles. Model # SC54LX 4-wheel $1249.00 IN STOCK! 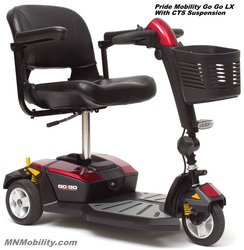 The Go-Go LX with Comfort Track Suspension (CTS) from Pride Mobility is one of the most advanced travel mobility devices on the market today. An all new frame design easily disassembles into five different pieces for storage and transportation. 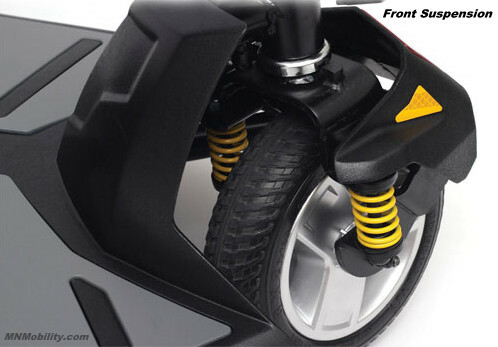 The peerless design pairs a compact travel scooter with an independent suspension. No other scooter on the market can compete! Match your mood with two sets of interchangeable colored panels that allows you to change the look of your Go-Go from red to blue. With a foldable, compact seat, a front basket, standard LED lighting and non-scuff tires, the Go Go LX offers the features and performance that you are looking for in your travel scooter. 300lbs. passenger weight capacity. Max speed: 4.4 mph. 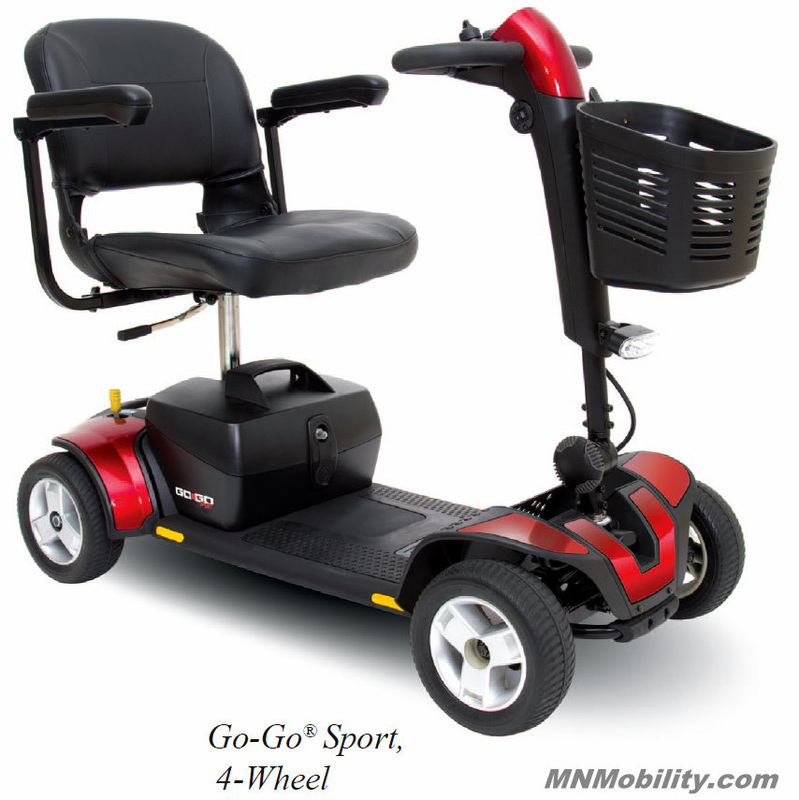 Seat size: 18"W x 17"D. Range: up-to 6 miles with 12 amp-hour batteries. Optional 18 amp-hour battery pack is available for $100.00. Model # SC73 3-wheel: $1249.00 IN STOCK! Model # SC74 4-wheel: $1349.00 IN STOCK! 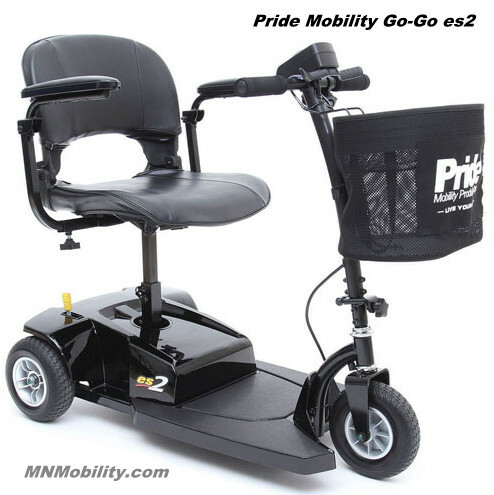 Pride Mobility's Go-Go Sport is a high-performance scooter with a 325lbs. weight capacity. 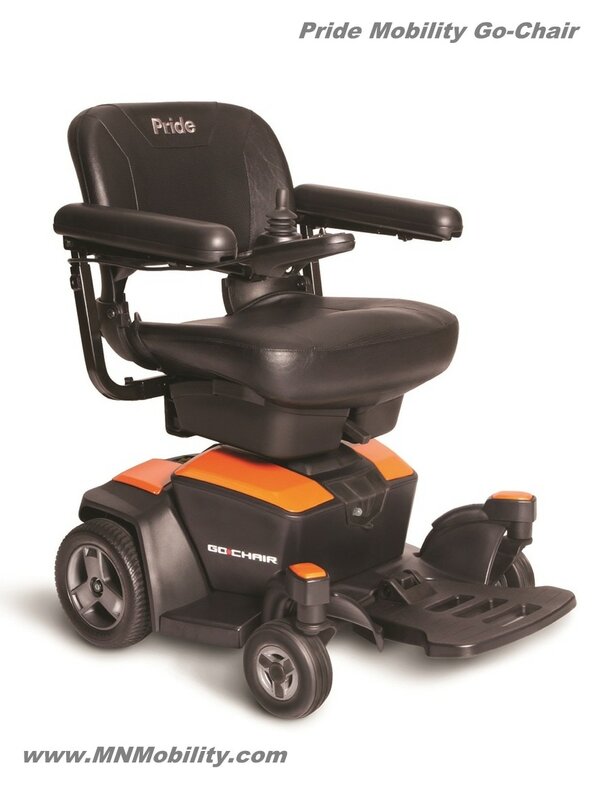 Pride's all new frame design allows for easy, feather-touch disassembly permitting easy storage or transport. 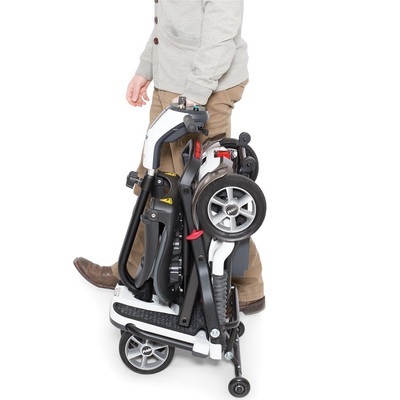 A sturdy, but light, travel-ready scooter! Front basket and bright LED headlight are standard. It comes with two sporty, interchangeable shroud panels in Blue or Red. Also standard are powerful 18 amp-hour deep-cycle batteries that let you enjoy up to 12 miles on a single charge! Max speed: 4mph. 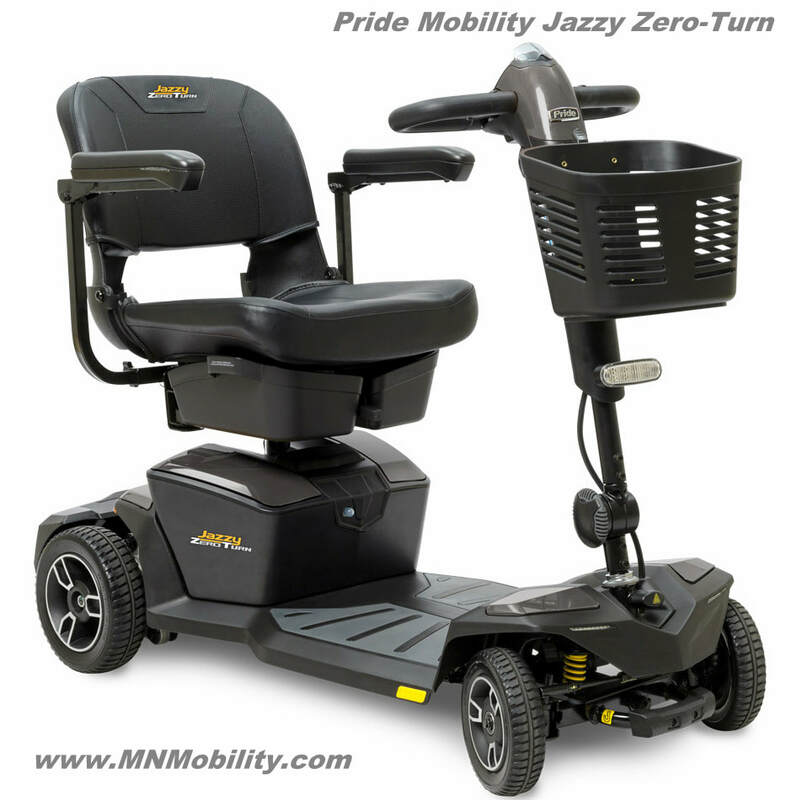 Seat size: 17"W x 17"D.
Get a 4-wheel scooter with a 3-wheel turning radius with the Jazzy® Zero Turn and Pride’s patented, intelligent-turning, iTurn Technology™. Navigate tight corners and small spaces effortlessly with a 38” turning radius. Illuminate your ride with bright LED lighting. Dual motors and CTS suspension ensure a smooth and comfortable drive. 300lbs. passenger weight capacity. Top-speed of 4 MPH. Driving range of up-to 10-miles. USB port for mobile device charging. Your choice of six interchangeable color shrouds: Red, Blue, Green, Black, White, & Pewter. Pride Mobility Go-Chair $1499.00​ IN STOCK!